Emily was attempting the impossible! Pursuing higher education while working a full-time job AND raising her three sons alone… turns out, she is no ordinary woman. Emily is full of courage and hope, power and possibilities. 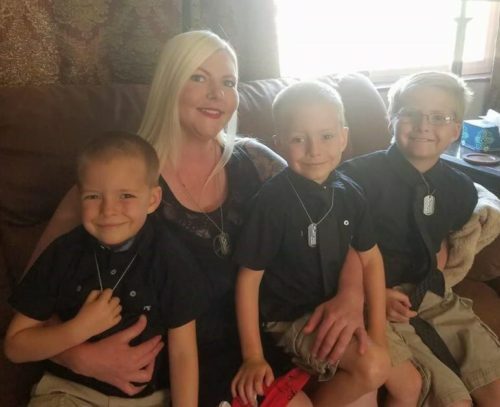 She took control of her life after an abusive marriage left her addicted, homeless and mourning the loss of a fourth child. She admitted herself into rehab and made a decision to stay sober and pursue a degree because she believed it was the critical first step to getting out of poverty. Receiving a WWIN Education Grant made it possible for Emily to continue her studies and has made the Dean’s List the last two quarters, even as she finds time to continue her work as a caregiver for the developmentally disabled. She’s finishing her AA with plans to transfer to CWU for a BS degree in Social Sciences so that she can give back and help another to rise from the ashes as she’s done. Before WWIN, it was such a burden to finance tuition and books when her boys needed winter coats and new shoes. It’s not easy for anyone to ask for money, but she persisted because she wanted to send an important message to her children that a better life is possible with hard work and dedication. Growing up on a dairy farm in Quincy with lots of animals, she was used to having many responsibilities. Emily and her sister felt lucky to have devoted parents who were involved in their school life. Emily is on a path of empowerment and looks ahead with a big smile. We are in awe of Emily’s fortitude; she’s made peace with her past and has her sights set on a bright future. Her message to others: “We can prosper, we can thrive. I am living proof of that”. WWIN Star Scholars Application Now Open!